Home › Pet Ownership › Did you just step in it? 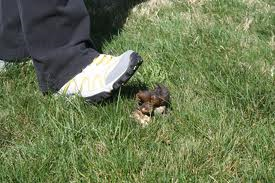 Has Everyone stepped in Dog Poop at some time in their life? Do some dog owners really think there are no consequences to not picking up after their dogs? One of the largest consequences is that the reputation of all dog owners takes a dive when just one dog owner does not pick up after their dog. This really steams me! Is it really so hard to grab a poo bag when you go out and bend over and pick up after your dog? Why does weather make any difference? It shouldn’t. The spring brings a huge amount of poo blossoms when the snow melts. Kicking snow over your dog’s poop in the winter is not the same as picking it up. When you cover it in snow it does not magically disappear. Right after it rains there are also a larger amount of unpicked up poo. Do people think that there dog’s poop is somehow directly related to the wicked witch of the west and will melt if it gets wet? I sincerely wonder what goes through these people’s minds. Personally, I am a not afraid to say something to someone who is walking away after their dog has just planted a steaming #2. (gushing with sweetness and just a touch of sarcasm) “Did you run out of pick up bags? Here are a couple till you can get home for more.” “You maybe didn’t notice (because you have been in full conversation mode on your phone) but your dog went poo back there. Do you need a pick up bag?” After I said this to someone they actually had the guts to say to me. “It’s ok, he is just a little dog.” You can just imagine how big my eyes got with that comment and I said “Large or small, poop is poop and everyone needs to pick up after their dogs.” For the good that it did, she just yanked her Chihuahua and stormed off and left me to pick it up. Which I did because of my sense of duty to the other responsible dog owners in my neighborhood. When you step in a little or a lot. It still gets in the grooves of your shoe and smells just as bad. Maybe if all the responsible dog owners would police the others just a bit more than we could make a dent into this problem that way. But, I do realize confrontation is a very difficult thing for some. So, I have another idea! I personally think the city needs to create citywide PSA campaign to get the word out that not picking up after your dog is not going to be acceptable in our city anymore. I think there should be TV PSAs, (public service announcements) and each alderperson should set aside a bit of money to spend on some signs that promote picking up after your dog. Not street signs but the less expensive honeycomb plastic ones and have them along regular dog walk routes and if dog owners were consistently seeing these reminders, I think we would put a pretty good dent in this total nuisance. They could say things like. Be a good neighbor! Pick up after your pet. or All seasons, All types of weather, All times of the day or night, Pick up after your pet. Lastly, I think that the city should have more garbage cans on the major side streets to have somewhere to place the poo bags. If the city and the alderpeople of the city took a bit more interest in what these irresponsible dog owners do, I think there would be so many positives from them working with the responsible dog owners to get rid of this problem. One of the positives might be that home/condo and apartment building owners and maintenance people would take better care of their yards/lawns because dog owners would be taught that the parkway is the appropriate place for your dog to do their business and not lawns and bushes. Make the neighborhood better looking and that would probably drive the home/condo/apartment values for the area UP! What other positives do you see for the improvement in this unsightly and disgusting problem? Any ideas on how to get the city to notice this problem and want to work with the responsible dog owners to improve this problem? Let’s make Chicago a dog friendly city with the Best Dog Owners anywhere! « Look Who’s the New Puppy! There was an article in the Chicago Tribune a few months ago that told about a condo development that took DNA samples of resident’s dogs’ poop, and if any was found on the grounds, it was sent in for ID and the owners were fined the cost of the test plus 50$. CSI pooper scoopers – I can see that coming on the Fall TV Schedule!